Juju already has knowledge of the AWS cloud, which means adding your AWS account to Juju is quick and easy. Amazon recommends the use of IAM (Identity and Access Management) to control access to AWS services and resources. IAM enables you to create users and groups with specific access rights and permissions, much like users and groups within a Unix-like environment. This is in contrast to the AWS-wide access that comes with using root-level secret keys. 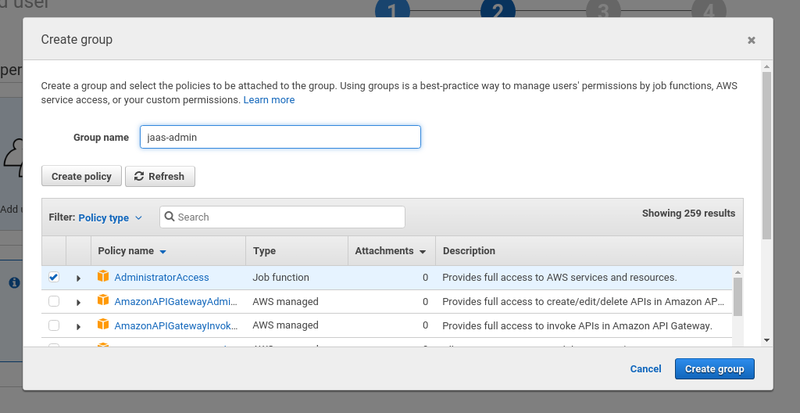 Enter a name for your user and set Programmatic access as the AWS access type before clicking "Next: Permissions" to continue. The next section will have you add credentials to Juju in the form of an "access-key" and a "secret-key". In the above, these correspond to 'AKIAIFII5EH5FOCYZJMA' and 'WXg6S5Y1DvwuGt72LwzLKnItt+GRwlkn668sXHqq'. In order to access Amazon AWS, you will need to add credentials to Juju. This can be done in one of three ways (as shown below). 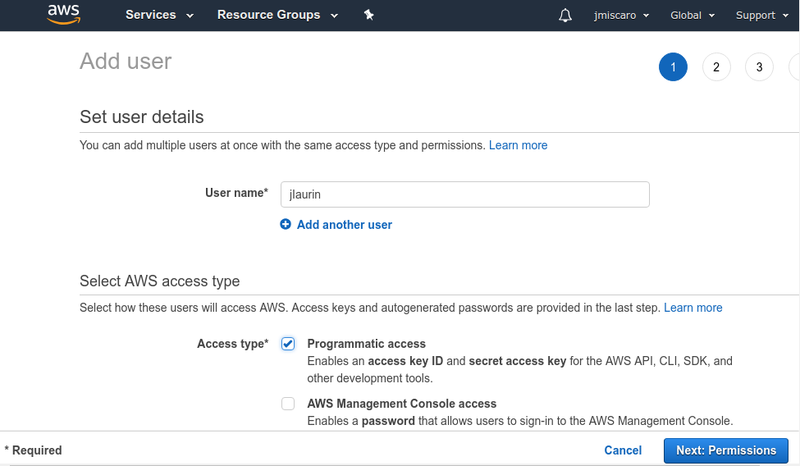 Credential "jlaurin" added locally for cloud "aws". On Linux systems, files $HOME/.aws/credentials and $HOME/.aws/config may be used to define these variables and are parsed by the above command as part of the scanning process. Above, the name given to the new controller is 'aws-controller'. AWS will provision an instance to run the controller on. Consistent naming, tagging, and the ability to add user-controlled tags to created instances. See Instance naming and tagging for more information. Juju's default AWS instance type is m3.medium. A different type can be selected via a constraint: juju add-machine --constraints 'instance-type=t2.medium'. For more information see Constraints. You can also view the list of Amazon EC2 instance types. A controller can be placed in a specific virtual private cloud (VPC). See Passing a cloud-specific setting for instructions.